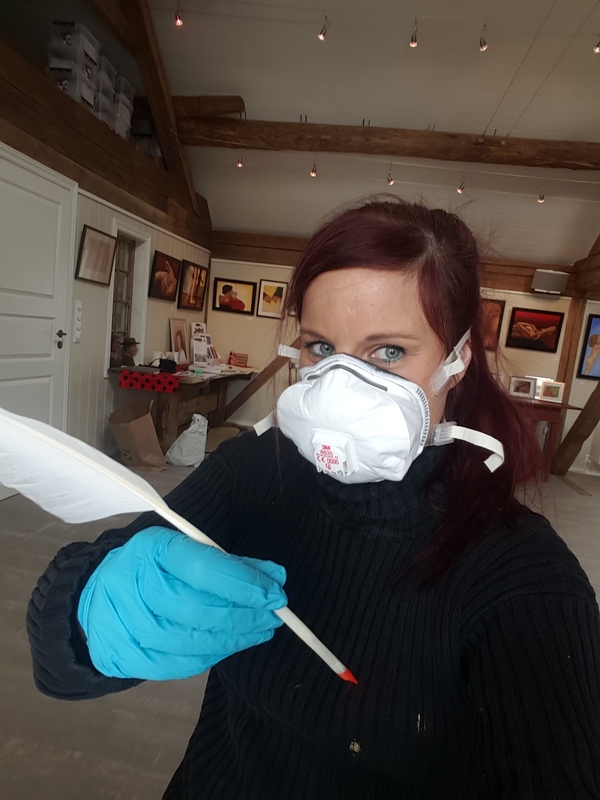 The tv-channel NRK visited me at my art studio on Wednesday. It will be broadcast on the news tonight (at 18:45). There will also be a longer film clip sent on the tv show “Norge Rundt” (around Norway), but I am still not sure which date. 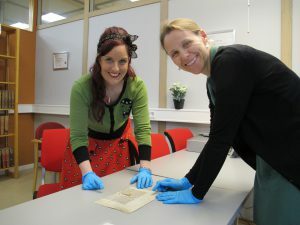 On the photo below yoiu can see me and Professor Lise Randeberg at the Gunnerus Library in Trondheim, on the table you can see an old document, this is from the period year 1200-1400. We are currently cooperating on a project, and this document is the reason why I have been working with a quill and on parchment for some time now. 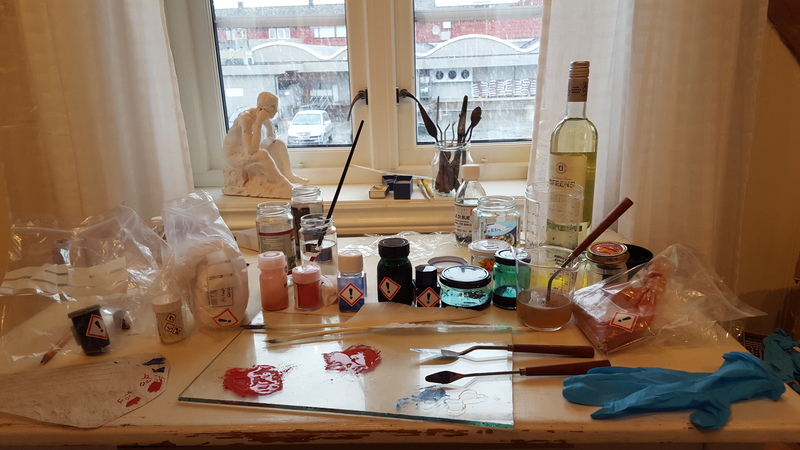 This project is a cooperation between The institute for Chemistry at NTNU (Emilio Catelli), Institute for Electronics and Telecommunications at NTNU (Professor Lise L Randeberg), The University Libraryat NTNU (Victoria Juhlin) and me. We are working with this fragment from an old document whic we know very little about. We believe it to have been made in the period year 1200-1400. NTNU have scanned this document with a hyperspectral camera. The information from this scanning has helped us find out a greta deal about the pigments and binders used. But as they know so little about how it has been made they decided to find an artist to help them make a reproduction. And that is where I came into the picture! 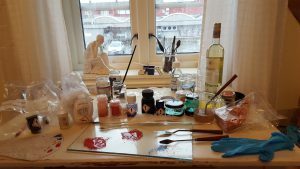 They are unsure about the methods used to mix the pigments, the tools and the techniques. A scanning of a reproduction can help them understand better if they have guessed correctly when it comes to the process and the materials. And thereby give them a greater understanding and bring them cloes to find out more about the document itself, where it comes from and when it was made. Maybe the rest of the book this fragment comes from still exists somewhere in the world? Can this project help us find it? This is almost like looking a for the missing piece of a treasure map! And I myself think it is very exciting to be a part of this project. Here is how my working days are looking like at the moment!